We had such a fantastic time at “our Mansion” in Orlando, that we are doing it again the first week of December. We will be in the same area, but this time we will be staying in a different multi-million dollar mansion that has 14 suites. We will be transforming the “in home theater” into our classroom. This worked out very well for us in February 2018. However, the theater has 16 reclining chairs with swing out tables and two tables with chairs at the back of the room. This means that we are limited in the number of people that can take classes. Space is limited to 20 people per day because we are in an actual theater room. We will have power to each row and we will be using the recliner chairs and 2 tables with 4 standard chairs in the back (see photos). We are not sure how the “swing out tables” work, so you may end up using your laptop as a “computer on your lap”. This is how it went at our event in February and it worked out well. If you require a table with chair spot you must have a conversation with Gayle ahead of time so that she can reserve this for you! If you would like to register for Day 1 or Day 2 or both Day 1 & 2 – click here to access the registration form. For those of you looking for an Exclusive All-Inclusive event, we will be doing what we did the first week of February and will all be staying in the house, playing in the house and learning in the house (yes PJ’s are allowed in classes)! The cost will include your hand picked suite in the house for 4 nights, 4 breakfasts, 3 lunches, 4 dinners, and all the snacks and drinks you can consume. And YES 3 days of hands-on Embrilliance classes plus plenty of group discussions & pow wow sessions about embroidery topics such as stabilizers, hooping techniques, needles, scissors, fusibles, cutting machines to cut fabric and/or vinyl mixed in with stories and laughter that will again make this all-inclusive exclusive event a fabulous experience. Space is limited to 13 suites in the mansion. Rooms will be chosen as you book, so book early to get the room of your choice. Cost $1675 for a private king room or $2000 for a room with two twin beds (you must have/find your own room mate for these rooms). NOTE: Both of the double bed rooms have sold so there are only 3 King rooms left as of June 18, 2018. Check in will be at 4pm on Dec 3rd, classes on Dec 4th, 5th & 6th and check out at 9am on December 7th, 2018. If you need a later check out that can be arranged for an additional fee. Deposit of $500 due at time of booking, final payment due on 10/1/18. Please be aware that there were plenty of things learned after hours so don’t hesitate to join us for the All-Inclusive event even if you do live close by. This is a one of a kind event and we know that you don’t want to miss out on any of the fun or education, not to mention the amenities the house has to offer. Space is limited to 5 students. Cost is $525 for all three days and includes lunch each day. Payment in full due at time of booking. NOTE: As of June 18, 2018 there are only 4 day pass options available. To reserve your 3-Day pass to this comprehensive event, please click here. 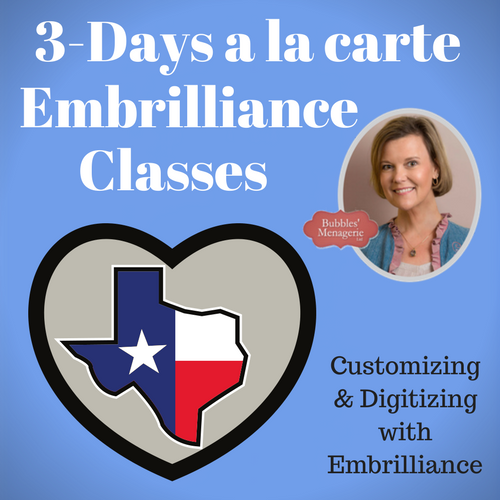 We have 3 full days of class time and we will cover ALL the Embrilliance software programs. We will learn about the Embrilliance customizing and digitizing programs. Starting out with customizing we will learn tips, tricks and shortcuts in Essentials, Enthusiast, Density Repair Kit & AlphaTricks. 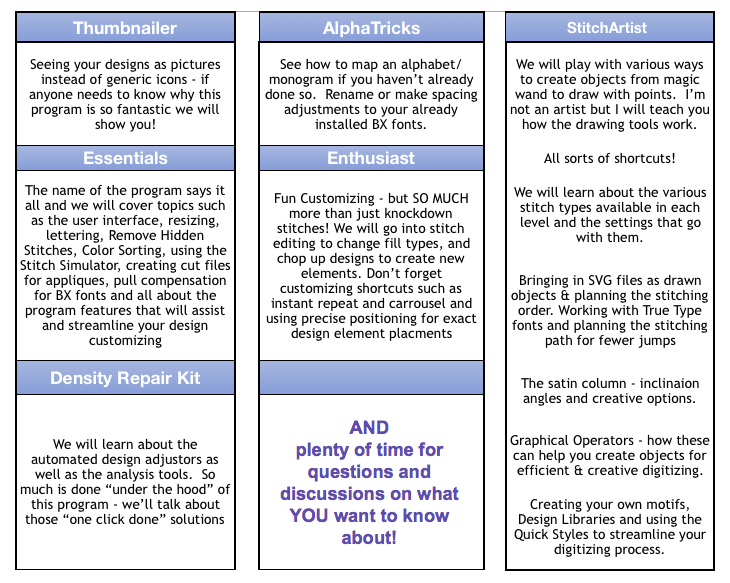 You may only have Essentials, but maybe that is because you don’t know how the other programs can save you time or assist you with your embroidery projects. So Essentials will be our starting point. Because it is such an integral part of the customizing suite, various functions are going to be interlaced throughout our class sessions. In fact, because of our smaller group size, we will be able to explore how all the programs can interact with each other! Use the best tool for the job – so we get done faster, right? So if we’re in the middle of a StitchArtist class and someone asks about moving stitches in an object to create a smoother edge…we will save our stitch file and open it into Enthusiast and go into stitch editing to move needle points and again save our stitch file using a different name so we don’t blow away the objects we were digitizing. The small group setting allows for a very fluid teaching schedule. We will also cover digitizing in StitchArtist 1, 2 and 3. We will start with the basics. I know that even those that have watched the youtube videos and are creating their own designs learn tips and tricks in the StitchArtist classes I have taught in the past. But again – smaller group allows us to delve into more detailed topics and instructions. And if digitizing isn’t your thing or you’re not interested in graphical operators at that moment and the pool or movie theater is calling you…. maybe a few of you want to toss around ideas for future projects with a beverage by or in the pool. This is that type of educational getaway! I can honestly say that the sheer amount of content and learning potential at this event is more than any we have done up to this date. Arrive at our multi-million dollar house on Dec 3rd, 2018 afternoon and be greeted with cocktails and snacks. Then settle in with our pizza party to get to know each other outside the classroom. You know when machine embroider-ers get together, we share and talk about what is important to us. Maybe you want to watch a movie in our own private screening room, or you may choose to take a dip in the heated pool or enjoy a soak in the hot tub. Have no fear, the learning will start after breakfast in the morning. Wake up to a home cooked breakfast before diving into our first class. We can talk about stabilizers in our PJs! Break for lunch, then back at it for another round of classes. Cocktails and light snacks while dinner is cooked for you. In the evening you will be able to once again enjoy the luxury accommodations. The next morning wake up to another home cooked breakfast before getting started again on classes. A good hearty breakfast for some super brain food. Break for lunch and then back at it again! Cocktails and snacks again while you relax and enjoy your surroundings. Then dinner and another relaxing evening. Have you noticed that we are not leaving the house? And if you’re thinking that Lisa is going to be cooking – ah, NO…. but are we in for a treat! Gayle was a chef/caterer in a former life and just like Lisa is going to WOW you and fill your heads with all the Embrilliance knowledge you can take (and then some! ), we are in for a culinary treat a la Gayle! On Dec 6th, 2018, wake up and stock up on some more delicious brain food before delving deep into Embrilliance once again. Lunch, class, cocktails and dinner to round out another great day. On the 7th, one last breakfast before we all say our goodbyes and get on the road to head home. What we are going for this time around is an all-inclusive immersive experience. We will take care of everything for you… accommodations, meals, snacks, beverages and of course Embrilliance, Embrilliance, Embrilliance. If you have any questions, do not hesitate to ask Gayle can be reached at 757-985-7786 or at NeverEndingStoryTravel@gmail.com. So there you have all the information! Sound like fun? Yes, we will certainly have fun while we are learning our Embrilliance software. If you are not ready to register because you still have questions, Click Here! For information on our cancellation policy please click here.